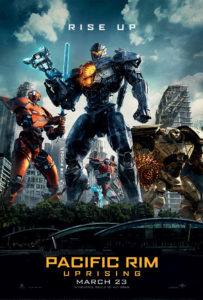 Stephen S. DeKnight directs this sequel to Guillermo del Toro’s 2013 movie Pacific Rim. Set ten years after the events of the original, the protagonist of Pacific Rim: Uprising is Jake (John Boyega), the misfit son of the hero Jaegar pilot Stacker Pentecost (Idris Elba). Jake lives a criminal life to support his slacker lifestyle. He swaps goods which includes stripping parts from broken Jaegar robots. With the world-building and basic backstories to the Jaegars, Kaiju and the rest already done in the first movie, Pacific Rim: Uprising wastes no time in experimenting with several interesting ideas within that setting. I expected a same-y sequel that followed the basic beats of the original story with some new visual effects trickery. Instead, PR:U is an always evolving story with plenty of plot twists and subversions to keep you engaged and guessing. John Boyega (who also produced the film) is fantastic in it, as is the rest of the new cast. Seeing Charlie Day and Burn Gorman return as the two quirky geniuses was a great thread back to the prior film. Pacific Rim Uprising is probably a better movie than the original, but it’s also the best Western-made kaiju movie to date. And possibly the best Transformers as well… Highly recommended. Reviewed in IMAX 2D.